The final session of the SITC 2017 Annual Meeting brought together leading experts in tumor immunology, applied mathematics, and theoretical physics to explore how knowledge from these disciplines can be assimilated to advance tumor immunotherapy. Opening the session Howard Kaufman, MD, FACS (Massachusetts General Hospital, Boston, MA) acknowledged co-chair Herbert Levine, PhD (Rice University, Houston, TX) and gave a brief historical overview, explaining how technological advances that allowed classification of immune cells re-positioned the field of immunology as a biological, rather than a chemical, science. With the concept of ‘self’ versus ‘non-self’ as a guiding principle, this complex molecular and cellular system is now known to be involved in almost every category of human disease. Our increasing confidence in the potential to manipulate the immune system for therapeutic benefit brings with it a mandate to understand its mechanistic complexity, and it is this imperative that drove the development of this multidisciplinary session. As disciplines, mathematics and physics both draw heavily on modeling to study complex systems. Methods from each can therefore be harnessed to increase understanding of the immune system, and response patterns to immune-based therapies. The goals of this cross-functional session were to define some of the most important questions in immune-oncology, and to identify how the emerging new fields of ‘immuno-physics’ and ‘immuno-mathematics’ can drive progress in understanding tumor immunology and immunotherapy. Having demonstrated robust efficacy, improved patient outcomes, and good tolerability across a wide range of cancers, the next challenge in immune oncology is to expand treatments to a broader range of patients, and increase response rates. Asking the right questions is essential if we are to achieve this, Francesco Marincola MD, explained. Given the sheer number of hypotheses to explain resistance to immune checkpoint inhibitors – which far outnumber the three recognized tumor immune landscapes: inflamed, stromal excluded, and the immune desert – many theories are presumably inaccurate, or are simply different ways of looking at the same phenomenon. Alternatively there could be more immune landscapes than are currently recognized. Dr. Marincola expressed the need for a unifying theory to explain the recognized immune landscapes, response patterns and corresponding resistance mechanisms. This would help researchers develop new anti-tumor agents that can turn immune-resistant cancers into operational therapeutic targets. In spite of the complex and contradictory models suggested to explain refractoriness to checkpoint inhibitor therapy, identifying prevailing mechanisms and methods to target them may not be as daunting as it first appears. Dr. Marincola described how, drawing on the work of others, and by evaluating transcriptional data associated with approximately 30 theories, he and his coworkers developed a ‘theory of everything’ to try to explain patterns of immune responsiveness and resistance. This theory proposes that cancer cells go through a conserved evolutionary bottleneck, facing a ‘two option choice’ to evade recognition by the immune competent host (Figure 1). Cancer cells can either adopt a clean oncogenic process, devoid of immunogenic stimuli (immune silent tumors) or, alternatively, follow an entropic biology that tends towards immune recognition (immune active tumors) but resists rejection by recruiting compensatory immune suppressive processes. These different strategies represent two entirely different types of cancer, and strategies aimed at enhancing the effectiveness of immune checkpoint inhibitors will need to be different according to the immune landscape targeted. Immune manipulation is likely to be most successful in targeting immune active tumors, while silent tumors should be approached with the goal of transforming their clean biology into a ‘messy’, immunogenic one. In the case of the latter, only therapeutic manipulations that affect the intrinsic cancer cell biology will be likely to succeed. Dr. Marincola concluded by introducing the newly formed Immune Responsiveness Task Force, led by SITC, which aims to identify, prioritize and address salient questions related to cancer immune responsiveness and resistance. Emphasizing that it is questions, rather than the answers, that the Task Force seeks to establish, he explained the focus on increasing understanding of the cancer cell biology that orchestrates distinct immune landscapes, and identifying conserved patterns of immune interaction between the host and cancers of different ontology. A workshop in May 2018 will include sessions on somatic genetics/epigenetics of the immune landscape; transcriptional patterns of distinct immune landscapes; the role of immunogenic cell death; experimental models of the immune landscape; and germline genetic contributions to immune landscape. It is hoped that increased understanding will allow improved, rational design and sequencing of combination immune-based therapies. Providing a logical follow-on, Thomas F. Gajewski MD. PhD (University of Chicago, Illinois) highlighted the need for an integrated, multidimensional biomarker to predict response to immunotherapy. Contrasting the T cell-inflamed (‘hot’) and non-inflamed (‘cold’) tumor microevironment (TME), Dr. Gajewski explained that the former is characterized by the presence of chemokines, CD8+ T cells, and a Type 1 IFN signature, with immune escape based on engagement of immune suppressive pathways that turn activated T cells back off (Figure 2). This is the phenotype seen is most immunotherapy responders. Conversely, the non-inflamed TME has a limited inflammatory signature with no intratumoral CD8+ T cells and an immune escape mechanism that relies on T cell exclusion from the TME. Immunohistochemistry (IHC) assays demonstrate that regulatory T cells (Tregs), programmed death-ligand 1 (PD-L1) and indoleamine 2,3-dioxygenase (IDO) are associated with CD8+ T cell infiltration and an immune gene signature that predicts response/resistance to anti-PD-1 monotherapy. However, a subset of patients with this gene signature do not respond to immunotherapy, indicating that the inflamed gene signature is necessary, but not sufficient, to predict treatment response. Furthermore, single predictive biomarkers, such as PD-L1 staining, have considerable limitations. Multiple dimensions of data will therefore be needed to capture the range of prognostic information, and provide a rational foundation to develop, select and combine IO agents in a way that inflames cold tumors, and coaxes tumors that are neither hot nor cold towards a more immunogenic phenotype. Dr. Gajewski went on to describe experimental data from studies exploring the molecular mechanisms that underpin the hot and cold TME. Key areas of focus include differences in tumor cell somatic characteristics, host germline genetics, and environmental influences such as commensal microbiota. Newly developed machine learning algorithms allow analysis and integration of different dimensions of complex, large datasets, and permit input of personalized data that may contribute to disease development. This was shown in a study from Eran Segal’s lab, in which analysis of dietary history and individual gut microbiome allowed researchers to accurately predict participants’ postprandial glucose responses using a machine-learning algorithm . Subsequent dietary modification prevented hyperglycemia in pre-diabetic patients, highlighting the potential for personalized approaches to reduce disease morbidity and mortality. Information integration has been key to a number of studies examining oncogene pathways. In one example, gene expression profiles from non-inflamed human melanoma samples were interrogated for mutated oncogene pathways that could drive T cell exclusion from the TME. Approximately half the samples had genomic evidence of activation of the tumor cell-intrinsic b-catenin pathway, with resulting failure to recruit Batf3 DCs, leading to a non-inflamed TME and resistance to checkpoint blockade . In studies evaluating environmental contributors to T cell TME infiltration, manipulation of microbiota – specifically, addition of Bifidobactirum – in tumor-bearing mice was shown to reduce tumor volume and, additively, to improve response to anti-PD-L1 therapy . This phenomenon has also been demonstrated in humans with metastatic melanoma. Data from 16S, shotgun sequencing and PCR studies demonstrate that Bifibacterium longum is more abundant in immunotherapy responders than non-responders, along with at least 9 additional bacteria species. Reconstitution of germ-free mice with microbiota from responders versus non-responders to anti-PD-1 could recapitulate the response pattern from patients , indicating a causal role for microbiotic manipulation in enhancing immunotherapy treatment efficacy. Summarizing, Dr. Gajewski reiterated that multiple tumor and host-derived factors have an impact on generation of an inflamed TME, and consequently on the efficacy of PD-1-targeted therapy. New machine learning techniques can help identify patterns and potential interactions between different dimensions of data in order to maximize the efficacy of predictive biomarkers, inform hypotheses about mechanisms of effect and develop new therapies. It is hoped that, over time, the results of such investigations will move us towards an era of personalized interventions for defined resistance mechanisms. Despite rapid advances in immuno-oncology research, clinical development of effective, well-tolerated immunotherapy agents remains a challenge. Describing the foremost clinical hurdles, Michael Postow, MD (Memorial Sloan Kettering Cancer Center, NY) explained the difficulty of extrapolating data from preclinical models, such as syngeneic orthotopic mouse models and patient-derived xenografts, into successful immunotherapy strategies in the clinic. One striking example is the disappointing results of anti-CTLA-4 therapy in the B16 preclinical melanoma model and the subsequent efficacy in clinical trials of patients with melanoma; the reverse was shown in pancreatic cancer, when encouraging laboratory results were not borne out in the clinic . Such phenomena highlight the need for preclinical models that more accurately represent the behavior of human cancer. A second challenge is to determine the most appropriate techniques to assess toxicity. Standard dose-limiting toxicity observation periods are usually too short to account for toxicity from immune checkpoint-blocking antibodies, which may take many weeks to set in . Further to this, standard oncology drugs are developed based on the maximum tolerated dose (MTD) principle, in which dose is titrated until tolerability limits further escalation. However, in the realm of immunotherapy it may be preferable to dose to optimal immunologic effect, in order to avoid levels of immune stimulation that could adversely affect antitumor immunity through, for example, T cell activation-induced cell death. Differences in drug class-based dose dependency present another challenge to developing across-the-board dosing recommendations. For example, higher doses of ipilimumab are associated with improved survival and higher toxicity  whereas dose-dependent effects are not typical with anti-PD-1 agents . In studies of pembrolizumab, the proportion of CD8+, PD-1+ T cells that are KI67+, or proliferate after treatment, increases almost immediately after starting pembrolizumab, indicating that PD-1 is altering the immunological status of peripheral blood . These data underscore the need for a pharmacodynamic, peripheral blood biomarker to guide drug dosing. It will also be valuable to compare data from monotherapy trials with those from emerging combination strategies to isolate the distinct immunological effects of each agent. Dr. Postow explored whether delayed tumor response to treatment, and the phenomenon of pseudoprogression, are unique to immunotherapy. Showing data from a randomized phase 3 trial of nivolumab versus dacarbazine in patients with metastatic melanoma, in which 8% of patients treated beyond disease progression with nivolumab (17/54) achieved 30% reduction in tumor burden, he emphasized that 4% (8/49) of the dacarbazine group had the same response pattern . This begs the question as to whether standard RECIST criteria or the recently developed immune-related response criteria (irRECIST) are better suited to the evaluation of response in early clinical studies. Outlining definitions of progressive disease, Dr. Postow noted that both sets of response criteria define progressive disease as ≥20% increase in target lesion size, but whereas new lesions are defined as progressive disease per RECIST, they do not automatically designate progressive disease per irRECIST [12, 13]. As such, differences in response criteria will likely be more relevant when evaluating progression-free survival (PFS) than overall response rates; responses are determined similarly between standard criteria and immunologic based criteria. New outcome measures are needed to evaluate response to combination therapies, and this is where mathematical modeling may provide information on tumor growth trajectories in clinical trials even prior to time zero, adding deeper understanding of the early effects of treatment on tumor growth (Figure 3). Such insights may help determine optimal drug sequencing and could be based on more complex tumor volume assessments. Computational biologists and mathematicians are needed to help interpret the vast number of potential molecular, immunologic, and demographic biomarkers with the ultimate goal of shifting the notion of a biomarker from ‘finding the right patient for a treatment’, as is the case with traditional oncogenic kinase inhibitors, to ‘finding the right treatment for a patient’, as is expected with the future of combination immunotherapy. Creativity in clinical trial design and endpoint development will be needed in order to develop and test the large number of combination therapies on the horizon in ways that meet regulatory expectations. 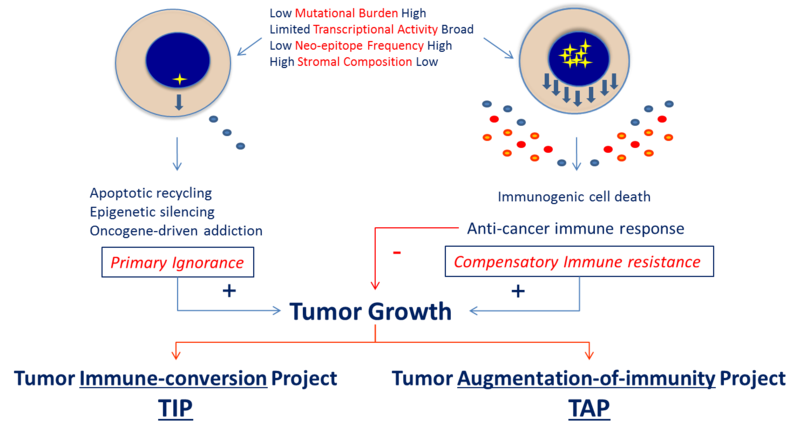 Figure 3: Mathematical modeling could provide information on tumor growth trajectory in clinical trials even prior to therapeutic intervention. The premise of immunotherapy has an important statistical question at its core: will a patient’s immune repertoire possess T cells that can recognize a typical set of tumor neoantigens? Aiming to shed light on mathematical principles that can be used to move towards an answer, theoretical physicist Curtis G. Callan, Jr, PhD (Princeton University, New Jersey) gave a brief introduction to the statistical ensemble approach to characterizing the repertoire of T cells in a given individual. Introducing the topic, he explained that the immune system is a non-deterministic system that uses statistical rules of operation. The number of distinct DNA sequences that can code for specificity-determining T cell receptors is so large that different individuals share very few specific T cell receptors. In addition, the VDJ recombination process that generates new T cells has built-in biases, with the result that different sequences can have wildly different probabilities of being generated in a single recombination event. Dr. Callan described how theorists have used the copious sequence data on T cell repertoires that has recently become available to infer the properties of the stochastic machinery that implements VDJ recombination. Reviewing new options for analysis and understanding that have thereby become available, he explained that one can assign to any given specific T cell receptor sequence (or any sequence motif) a ’generation probability’ –– the probability that this sequence (or a sequence with this motif) will be created in any single recombination event (Figure 4). This number ranges over more than ten orders of magnitude for the T cells in a typical biological sample. Furthermore, there are many sequences that have a sufficiently high generation probability to guarantee their occurrence at least once in most individuals, simply as the result of a bias in the VDJ recombination process. Most, if not all, ‘public sequences’ will be of this accidental kind, not arising as the result of any functional selection. Another consequence of having mastered the stochastic nature of the VDJ recombination process is that it is now possible to generate synthetic sequence repertoires that are ‘typical’ (in all meaningful statistical senses) of human T cell repertoires. The findings described by Dr. Callan have considerable potential significance for immunotherapy because the immune system can only recognize and destroy cancer cells if the patient’s T cell repertoire contains T cells that recognize the patient’s specific oncogenic mutations. Whether or not this is ‘typically’ the case is a key therapeutic question, the answer to which depends on a) the statistics of human individual T cell repertoires, and b) the rules for recognition by specific T cell receptor sequences of specific MHC-presented peptides. As explained in Dr. Callan’s presentation, there is now a foundation for a quantitative understanding of point a) but there is not yet a corresponding level of understanding of point b). Obtaining such an understanding is an increasingly urgent task for fundamental research in support of immunotherapy. Figure 4: Pgen(σ) is the net probability that the read σ is produced in a single stem cell event. It is a measure of the “surprise” value of σ. Applied mathematician Doron Levy, PhD (University of Maryland, MD) described the perspective gained by addressing questions in immune oncology in terms of systems rather than individual diseases. Taking a different approach to ‘big data’ methods such as machine learning, he described how mathematical models can capture disease dynamics in a unique way, combining immune system, disease, and drug dynamics in a set of equations. By way of demonstration, Dr. Levy showed a multi-compartment model that represents the dynamics of chronic myeloid leukemia (CML). Under this model, T cells, represented in a single compartment, interact with CML stem cells, progenitor cells, differentiated cells and terminal cells in the other compartments and destroy them with certain probabilities (Figure 5). Combining this dynamic model with experimental data from two studies of imatinib in CML [14, 15] allowed researchers to demonstrate the role of anti-leukemia T cells in preventing CML relapse over several years, and to hypothesize that the immune system is fundamental to maintaining disease remission under imatinib therapy. Figure 5: Use of mathematical models such as this can provide information on the probability of immune cell destruction of cancer cells under certain conditions. Reproduced from . One of the most elegant aspects of mathematical modeling is the ability to refine a given model in light of new experimental data. As such, assuming the immune system plays an active role in limiting disease progression, the logical next step is to augment the model with new information to ascertain when during the disease course it is optimal to stimulate the immune system, and by how much. Over time, the model can be further amended to account for new information on disease burden and immune response gained from long-term experimental follow-up data. The ultimate goal of this iterative process is to generate a sufficiently sophisticated, dynamic model to indicate how disease burden and immune response are likely to vary from patient to patient in ways that can then be tested –and hopefully validated– in clinical trials. Mathematical models provide quantitative tools that can be used to optimize patient-specific therapy. Dr. Levy emphasized the importance of involving quantitative scientists at the design stage of clinical trial development, to ensure that key model parameters are included at the outset. He then demonstrated the level of sophistication, and practical value, that modeling can bring to understanding immune responses to cancer. Presenting a recently published mathematical model of the dynamics of drug resistance in solid tumors , Dr. Levy explained how heterogeneous cancer cells can emerge under the selective pressure of different chemotherapy environments, with resistant traits emerging at different locations within the tumor. This model, which predicts that higher doses of cytotoxic drugs can delay disease relapse but select for more resistant cell types, can be used to help develop an optimized drug regimen that minimizes resistance. Concluding, Dr. Levy appealed to the audience to reach out to bioinformaticians, mathematicians and other quantitative scientists to work together to solve the most pressing problems in immune oncology. Fitness-based evolutionary models, driven by antigen recognition, have had success in predicting aspects of virus evolution. Theoretical physicist Benjamin Greenbaum, PhD (Tisch Cancer Institute, New York) presented a mathematical model of response to checkpoint inhibitor immunotherapy based on recognized genomic correlates of response, such as the improved responses seen in highly mutated tumors and the negative impact of tumor heterogeneity [17-20]. Dr. Greenbaum partnered with Dr. Marta Luksza (Simons Center for Systems Biology, Princeton, New Jersey) to develop a model that quantifies the fitness cost of neoantigens to the evolution of a cancer cell population (Figure 6). Specifically, the model quantifies the likelihood that neoantigens are recognized across a tumor’s subclones by taking into account the relative presentation of a neoantigen to its wild type counterpart by class-I MHC, and the probability it will be recognized by a T-cell receptor. The model was benchmarked on three public datasets, stratifying the population into responders or non-responders, and was found to be expandable such that additional variables within the TME, e.g., cytolytic score, could be incorporated to increase predictability. Application of the model allowed consistent prediction of response across a series of melanoma patient cohorts treated with anti-CTLA4 therapy, and lung cancer patients treated with anti-PD-1 agents. By applying this approach, which connects with the underlying mechanisms of immune tumor recognition, it was possible to generalize further to study neoantigen-driven evolution outside the immunotherapy context. In a recent study by Balachandran et al., unique neoantigen qualities were shown to be associated with long-term survival following pancreatic cancer . Tumor mutation burden (TMB) alone was not predictive of long-term survival, but the combination of TMB plus CD8+ T cell infiltration was highly predictive. It was also possible to detect intratumoral and lasting circulating T-cell reactivity to high-quality neoantigens in long-term survivors of pancreatic cancer, including clones with specificity to both high-quality neoantigens and predicted cross-reactive microbial epitopes. These results suggest that an underlying mechanistic theory of neoantigen-driven tumor evolution may be of broadly predictive value when considering response to treatment. Q: Is there a way to overlay our probabilistic understanding with knowledge of immune active versus immune silent tumors to predict when we have one phenotype or the other? A: (Levine) The only way multiple factors could contribute to the binary ‘active versus silent’ choice is if factors were somehow reinforcing one another. Factors such as Th1, stromal cells etc. would have to be combined in a coordinated way if the outcome really is binary. (Gajewski) I think what Herb just described is a metaphor for transcription factors connected to differentiation states of cells. There are intermediate states where multiple transcription states are present, but synergy and regulation eventually lead to an inflamed or non-inflamed TME. But it’s not quite as dichotomous as we’re making it sound. Bioinformatically, the landscape falls into at least three clusters so we should avoid thinking of the situation as black and white. We could consider whether there’s a threshold for a gene signature that leads to a particular outcome. (Marincola) If we apply evolutionary logic, pathways are strongly correlated but there is variation. There must be cause and effect in the evolutionary process: only cancers that evade the immune system in a particular evolutionary environment can survive; those that are sufficiently immunogenic will not. (Gajewski) T cell-based inflammation has a feed-forward loop. Once the right dendritic cells are present, and T cells are primed, when initiating chemokines for T cell recruitment in the TME see their antigen again they make additional chemokines and induce further cellular recruitment. This is analogous to transcription factor-based cellular differentiation states. The feed-forward mechanism separates the hottest from the coldest tumors. Q: Can you use your model to predict which neoepitopes are more likely to be immunogenic? A: (Greenbaum) I’d consider the question in two different settings, the immunotherapy setting and the vaccine setting. The goal is for information generated by our models to inform a vaccination strategy that allows targeting of cells that are not presented in a way that allows recognition in the context of checkpoint blockade therapy, which requires immune stimulation. (Gajewski) Cancer immunology is currently limited to prediction algorithms for these antigens. If you consider antigen specificity in the setting of autoimmunity, many antigens that have been defined have had extensive post-translational modification of the epitope that are not reflected by primary DNA sequence. For vaccine development you need to know which the truly immunogenic epitopes are. Peptide elution using tissue from patients, rather than prediction algorithms, may be necessary to expand this for therapeutic purposes. Cancer immunologists are trying to reproduce what happens naturally with autoimmunity, and the antigens being seen are more complex. Q: How sophisticated is our understanding of the mechanistic aspects of the immune response and the microbiome? A: (Gajewski) This is a huge area of investigation. In mouse models you can transfer supportive microbiota and in 3-4 days you’ll see immune changes. We don’t believe this is due to antigen mimicry by the microbes, and the immune activity seems to be distant from the site of the gut. The earliest effects are seen in the dendritic cell compartment in tumor draining lymph nodes and the TME. The hypotheses being tested are 1) that there are one or more soluble circulating factors exerting this positive effect – metabolites from the microbiota, cytokines from the host – or 2) that there is a cellular-based circulating factor instructed by the gut, that informs tumor draining lymph nodes and the TME. Gajewski TF, Schreiber H, Fu YX: Innate and adaptive immune cells in the tumor microenvironment. Nature immunology 2013, 14(10):1014-1022. Zeevi D, Korem T, Zmora N, Israeli D, Rothschild D, Weinberger A, Ben-Yacov O, Lador D, Avnit-Sagi T, Lotan-Pompan M et al: Personalized Nutrition by Prediction of Glycemic Responses. Cell 2015, 163(5):1079-1094. Spranger S, Bao R, Gajewski TF: Melanoma-intrinsic beta-catenin signalling prevents anti-tumour immunity. Nature 2015, 523(7559):231-235. Sivan A, Corrales L, Hubert N, Williams JB, Aquino-Michaels K, Earley ZM, Benyamin FW, Lei YM, Jabri B, Alegre ML et al: Commensal Bifidobacterium promotes antitumor immunity and facilitates anti-PD-L1 efficacy. Science (New York, NY) 2015, 350(6264):1084-1089. Matson V, Fessler J, Bao R, Chongsuwat T, Zha Y, Alegre ML, Luke JJ, Gajewski TF. The commensal microbiome is associated with anti-PD-1 efficacy in metastatic melanoma patients. Science 2018;359(6371):104-108. Twyman-Saint Victor C, Rech AJ, Maity A, Rengan R, Pauken KE, Stelekati E, Benci JL, Xu B, Dada H, Odorizzi PM et al: Radiation and dual checkpoint blockade activate non-redundant immune mechanisms in cancer. Nature 2015, 520(7547):373-377. Weber JS, Hodi FS, Wolchok JD, Topalian SL, Schadendorf D, Larkin J, Sznol M, Long GV, Li H, Waxman IM et al: Safety Profile of Nivolumab Monotherapy: A Pooled Analysis of Patients With Advanced Melanoma. Journal of clinical oncology : official journal of the American Society of Clinical Oncology 2017, 35(7):785-792. Ascierto PA, Del Vecchio M, Robert C, Mackiewicz A, Chiarion-Sileni V, Arance A, Lebbe C, Bastholt L, Hamid O, Rutkowski P et al: Ipilimumab 10 mg/kg versus ipilimumab 3 mg/kg in patients with unresectable or metastatic melanoma: a randomised, double-blind, multicentre, phase 3 trial. The Lancet Oncology 2017, 18(5):611-622. Robert C, Ribas A, Wolchok JD, Hodi FS, Hamid O, Kefford R, Weber JS, Joshua AM, Hwu WJ, Gangadhar TC et al: Anti-programmed-death-receptor-1 treatment with pembrolizumab in ipilimumab-refractory advanced melanoma: a randomised dose-comparison cohort of a phase 1 trial. Lancet (London, England) 2014, 384(9948):1109-1117. Huang AC, Postow MA, Orlowski RJ, Mick R, Bengsch B, Manne S, Xu W, Harmon S, Giles JR, Wenz B et al: T-cell invigoration to tumour burden ratio associated with anti-PD-1 response. Nature 2017, 545(7652):60-65. Robert C, Long GV, Brady B, Dutriaux C, Maio M, Mortier L, Hassel JC, Rutkowski P, McNeil C, Kalinka-Warzocha E et al: Nivolumab in previously untreated melanoma without BRAF mutation. The New England journal of medicine 2015, 372(4):320-330. Nishino M, Giobbie-Hurder A, Gargano M, Suda M, Ramaiya NH, Hodi FS: Developing a common language for tumor response to immunotherapy: immune-related response criteria using unidimensional measurements. Clinical cancer research : an official journal of the American Association for Cancer Research 2013, 19(14):3936-3943. Eisenhauer EA, Therasse P, Bogaerts J, Schwartz LH, Sargent D, Ford R, Dancey J, Arbuck S, Gwyther S, Mooney M et al: New response evaluation criteria in solid tumours: revised RECIST guideline (version 1.1). European journal of cancer (Oxford, England : 1990) 2009, 45(2):228-247. Kim PS, Lee PP, Levy D: Dynamics and potential impact of the immune response to chronic myelogenous leukemia. PLoS computational biology 2008, 4(6):e1000095. Chen CI, Maecker HT, Lee PP: Development and dynamics of robust T-cell responses to CML under imatinib treatment. Blood 2008, 111(11):5342-5349. Cho H, Levy D: Modeling the chemotherapy-induced selection of drug-resistant traits during tumor growth. Journal of theoretical biology 2018, 436:120-134. Rizvi NA, Hellmann MD, Snyder A, Kvistborg P, Makarov V, Havel JJ, Lee W, Yuan J, Wong P, Ho TS et al: Cancer immunology. Mutational landscape determines sensitivity to PD-1 blockade in non-small cell lung cancer. Science (New York, NY) 2015, 348(6230):124-128. Snyder A, Makarov V, Merghoub T, Yuan J, Zaretsky JM, Desrichard A, Walsh LA, Postow MA, Wong P, Ho TS et al: Genetic basis for clinical response to CTLA-4 blockade in melanoma. The New England journal of medicine 2014, 371(23):2189-2199. Riaz N, Havel JJ, Makarov V, Desrichard A, Urba WJ, Sims JS, Hodi FS, Martin-Algarra S, Mandal R, Sharfman WH et al: Tumor and Microenvironment Evolution during Immunotherapy with Nivolumab. Cell 2017, 171(4):934-949.e915. McGranahan N, Furness AJ, Rosenthal R, Ramskov S, Lyngaa R, Saini SK, Jamal-Hanjani M, Wilson GA, Birkbak NJ, Hiley CT et al: Clonal neoantigens elicit T cell immunoreactivity and sensitivity to immune checkpoint blockade. Science (New York, NY) 2016, 351(6280):1463-1469. 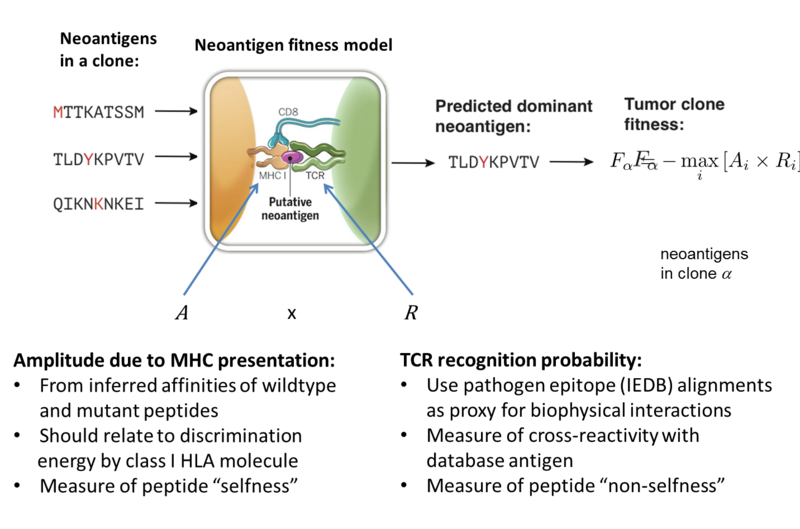 Luksza M, Riaz N, Makarov V, Balachandran VP, Hellmann MD, Solovyov A, Rizvi NA, Merghoub T, Levine AJ, Chan TA et al: A neoantigen fitness model predicts tumour response to checkpoint blockade immunotherapy. Nature 2017, 551(7681):517-520. Balachandran VP, Luksza M, Zhao JN, Makarov V, Moral JA, Remark R, Herbst B, Askan G, Bhanot U, Senbabaoglu Y et al: Identification of unique neoantigen qualities in long-term survivors of pancreatic cancer. Nature 2017, 551(7681):512-516.